Ever since Lalu Yadav was jailed last year, Tejashwi Yadav has been leading the party and has been credited for its success in at least three bypoll wins. Tejashwi Yadav has denied rumours of rift with his elder brother Tej Pratap. 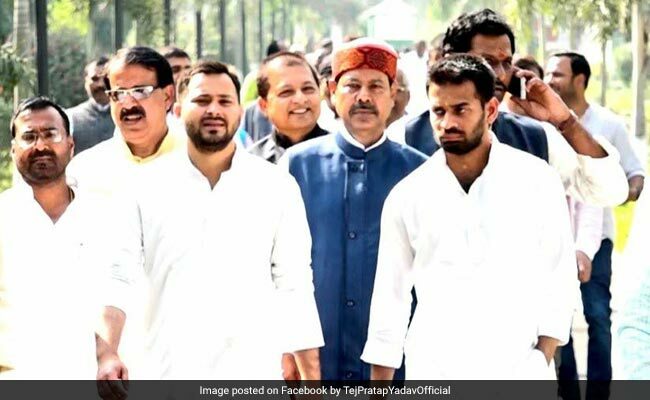 Tejashwi Yadav, son of Lalu Yadav and Leader of Opposition in the Bihar Assembly, on Sunday denied rumours of rift with his elder brother Tej Pratap Yadav. While addressing the media, Tejashwi Yadav said that Tej Pratap is his guide. "It is very evident Tej Pratap ji spoke on strength of the party. He spoke about how to unify and strengthen our party, ahead of 2019 (general election) and 2020 (Bihar assembly election). Unhone spasht kaha hai Tejashwi kaleje ka tukda hai. He is my brother and guide," Tejashwi Yadav said. Tejashwi Yadav claimed that such rumors were being spread to divert people's attention from real issues affecting Bihar. "All are working to strengthen the party. We shouldn't make mountain out of a molehill. We must focus on discrepancies in education, how students were given 38 out of 35 marks, how 44 young girls were raped. If you ignore this, Bihar isn't going to benefit at all," he said. His reaction comes days after his elder brother had hinted that all is not well within the party. On June 9, Tej Pratap took to Twitter and drew references from the epic 'Mahabharat', saying he was thinking of going to Dwarka after installing Arjun - seen as a reference to his younger brother Tejashwi - as the king. "But there are some who feel troubled if I were to be called the kingmaker". Ever since RJD chief Lalu Yadav was jailed in December last year for corruption, his younger son Tejashwi Yadav has been leading the party and has been credited for its success in at least three bypoll wins. On the other hand, Tej Pratap Yadav who was Health Minister in the earlier Bihar government has courted controversy more than once. Last year when Lalu Yadav's security was downgraded, he had said he could "skin Prime Minister Narendra Modi" - a remark even his father had disapproved of. Tej Pratap Yadav denies any rift with his brother but says he is unhappy with the goings-on is the party, which he blamed on "anti-social elements" within the RJD.